Happy 35th birthday Voyager 1! You may have launched 16 days after your twin, Voyager 2, but you have travelled further than any man-made object ever built. You are nearly 18 billion kilometers from home tonight – or almost 17 hours of travel time at the speed of light. You are travelling nearly 60,000km/h – or 500 million kilometers per year. You have seen truly amazing things, and helped us to understand our place in the cosmos a little bit better. You have opened our eyes to the true diversity of our solar system (like geysers of liquid nitrogen erupting at 40 degrees above absolute zero…aka -233 degrees Celsius). This is a short video displaying some of the incredible photographs you’ve taken (both Voyager 1 & 2) as you explored Jupiter, Saturn, Uranus, and Neptune. These are all actual photos. And now, you are about to break though into interstellar space. Thanks for the memories, and we can’t wait to see what’s next! The video below (1 hour, 14 minutes in length) is the press conference and panel discussion from NASA’s Jet Propulsion Laboratory in California (that is where the Voyager mission is operated from), recorded the evening of September 4, 2012. It is a guided tour of the entire Voyager mission, led by the legendary Ed Stone. It’s definitely worth your time. To read more fully about the Voyager mission you can read two of my previous blog posts on the subject: Happy 35th birthday Voyager 2 and The Pale Blue Dot. Happy 35th birthday Voyager 2! Voyager 2 launched on August 20, 1977. It was built (along with its identical twin Voyager 1) to explore the outer planets of our solar system – namely Jupiter, Saturn, Uranus and Neptune. It did all that, and to this day is the only spacecraft to visit Uranus and Neptune. 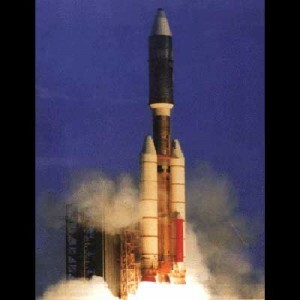 On top of that, as of a week ago (August 13, 2012) Voyager 2 became the longest operating spacecraft in human history. It surpassed Pioneer 6, which launched on December 16, 1965, and sent its last signal back to NASA’s Deep Space Network a cool 12,758 days later on December 8, 2000. Voyager 2 is nearly 15 billion kilometers from the Earth today. At the speed of light, it would take you about 14 hours to get there. Voyager 1’s 35th birthday is coming up in 16 days, on September 5, 2012 – and in spite of launching a couple weeks after Voyager 2, Voyager 1 is even further away: Voyager 1 is over 18 billion kilometers away from Earth, or nearly 17 hours of light-travel time. The Voyager mission was planned when it was because of an uncommon alignment of the four outer planets – Jupiter, Saturn, Uranus, and Neptune – which allowed all the planets to be visited in a single mission. Voyager 1 visited Jupiter and Saturn and then used a gravity assist/slingshot from Saturn and headed north – directly towards the edge of the solar system. Voyager 2 took a less direct route to the edge (which explains why it isn’t as far away) visiting Jupiter, Saturn, Uranus, and finally Neptune before using a gravity assist/slingshot to head towards the edge of the solar system in a southerly direction. Both Voyagers are currently in a region of space called the Heliosheath, which is the outermost layer of the Heliosphere where the solar wind is slowed by the pressure of interstellar gas. They’re right on the very edge of our solar system, and based on the current readings and data that the spacecraft are sending back to us, it is suspected that they will “break through” into interstellar space in the very near future (“near future” meaning it could be months or a few years). Both spacecraft are travelling about 60,000km/h, though Voyager 1 is travelling slightly faster than Voyager 2. Their radioisotope thermoelectric generators will be able to sustain sufficient electrical output to operate until 2020, or possibly until 2025. It’s so incredible to me that these two spacecraft still function 35 years after their launch, using 1970s technology, and on a daily basis continue to answer questions about the universe we live in. The cooler thing to me about these spacecraft is that they are truly about exploration. The Voyagers were launched because we didn’t know what we didn’t know. They intended not only to answer questions, but to find new questions that we hadn’t thought of asking yet – and they continue to be successful on all accounts. This is true exploration. To read more about the 35th birthday of Voyager 2, click here. To read more about the Voyagers and their ongoing mission in general, click here. Closest approach to Neptune (4,800km): August 25, 1989 – yes you read that correctly…Voyager 2 passed a mere 4,800km above Neptune’s north pole! I’ve been thinking a lot about space recently, mainly on account of the Curiosity landing, though not just that. There has been quite a lot of exciting space-related news items and discoveries lately. 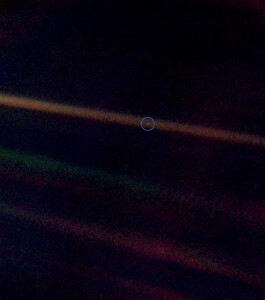 It seems though whenever I start looking towards the heavens, I end up at the same place: the pale blue dot. That’s a term coined by Carl Sagan, who amongst various other things worked on the Voyager mission. The Voyager 1 spacecraft was launched (along with her sister ship Voyager 2) in the summer of 1977 on a mission to explore the outer planets of our solar system. Voyager 1 passed by Saturn and Jupiter before ‘slingshotting’ itself using Jupiter’s gravity towards the edge of our solar system. Voyager 2 passed by Saturn, Jupiter, Uranus, and Neptune before continuing towards the edge of our solar system (to this day Voyager 2 is the only spacecraft to visit Uranus and Neptune). Voyager 1, having completed its primary mission of exploring Jupiter and Saturn was preparing to turn off some of its instruments, including its camera. Before this happened however, Sagan convinced the powers that be at NASA’s Jet Propulsion Laboratory to turn the camera back towards home one last time. Between February and June 1990, Voyager 1 snapped 60 images of our solar system, including pictures of all the planets (excluding Mercury, which was too close to the sun for it to show up). At a distance of a little over six billion kilometers, Voyager 1 took our first true Family Portrait. And we saw ourselves. A fraction of a pixel, in a sunbeam, our entire history was before our eyes. Carl Sagan actually ended up naming his next book after this picture. And I can understand why. Whenever I wonder about space and look at the amazing images that we have captured of the cosmos using Hubble, or other amazing tools, my imagination starts to stir. But in looking at those images, one fact always remains: they are pictures of other places. This mosaic from Voyager 1 was a picture from “out there” looking back towards home. Whether or not my rendition of Carl Sagan is to your liking (hit play on the video at the top of the page and decide for yourself), I hope that his words strike a chord. It’s an important piece of perspective. As we continue to explore the cosmos, it’s nice to remember what home looks like. Both Voyager 1 & 2 continue to operate to this day, and continue to send back data. At the time of posting this, Voyager 1 is the more distant of the two spacecraft and it is 18,122,605,000 km away from Earth. At the speed of light it would take nearly 17 hours to travel that distance. Both Voyagers continue their journey towards interstellar space at speeds approaching 60,000 km/h. In my video (at the top of the page), the grainy image of Earth with the Moon in the foreground was the first image ever taken of Earth from the Moon. It was taken on August 23, 1966 by the Lunar Orbiter 1 spacecraft. Also in my video is a picture of an astronaut standing in an open hatch while in orbit around Earth. That was on March 6, 1969 during the Apollo 9 mission. They were testing docking procedures in preparation for landing on the Moon, which happened in July 1969 during Apollo 11. And finally, another historical image: the “you are here” image. 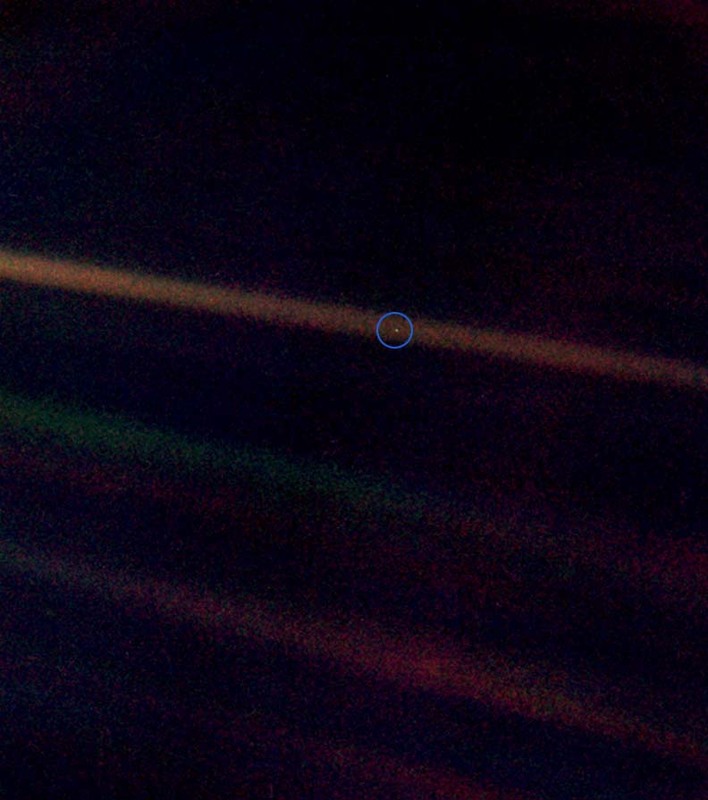 That is the first image ever taken of the Earth from another planet. 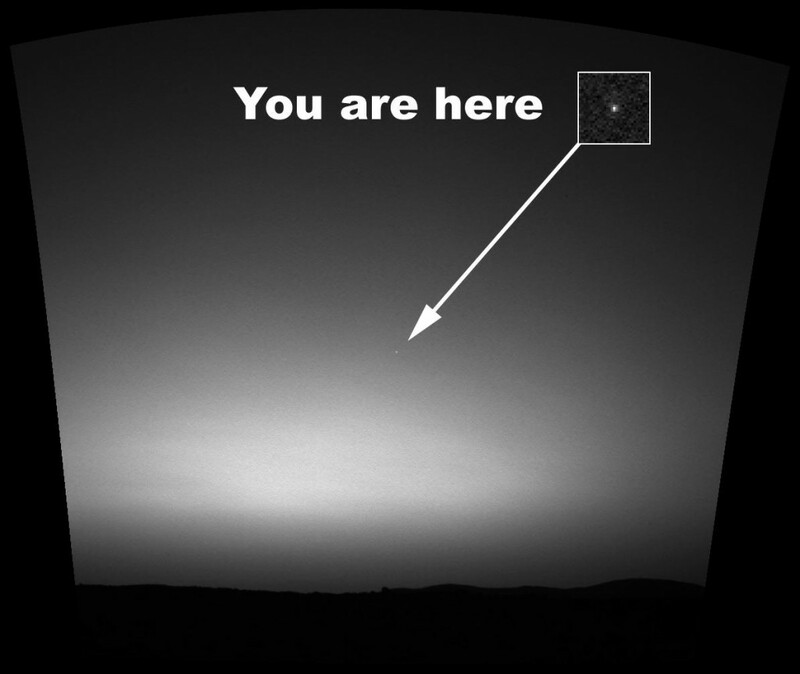 It was taken from Mars in March 2004 by the Spirit rover (one of the Mars Exploration Rovers). It’s a mosaic of images taken just before Martian sunrise.